Having it in Puerto Rico. Having the beautiful island of PR as their backdrop. Getting married in a 16th century cathedral. As you can see, it promised to be a much more Puertorican event that even most of my local clients hold. So even from the beginning, I knew their wedding was something to look forward to. Their day started at the beautiful Caribe Hilton Hotel, located right in the entrance of Old San Juan. After finished with their getting ready, we jumped right away to the swan pond, where L&M had their first look session -epic swan photobomb included-, followed by their formal portraits. Afterwards, we drove to the breathtaking San Juan Bautista Cathedral, where their beautiful ceremony took place. After their I-do’s, we took a stroll through the colorful, cobblestone streets of the old colonial city for their newlywed photo session. We decided that the best way to survive the photo session was to be the four of us in my car, instead of a limo, and it was the best decision we could have made: their wedding coincided with the Campechada Festival. This festival marks the beginning of Christmas in Puerto Rico, and Old San Juan was PACKED! 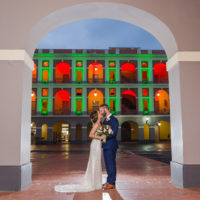 They were really patient and we could do all the photos in their wedding bucketlist: colorful streets, El Morro Fortress, beach views, and sunset photos. Lara & Mark’s event surpassed every expectation I had. They are such a cool, funny couple, their theme came across beautifully through every detail, and we had a beautiful day as a backdrop for their wedding memories. I am so happy and grateful for your trust in my work for your big day, and I hope it’s not the last time you and my lens meet!